Again, this is an author that my husband introduced me to. Last year, for our anniversary, we took a road trip down to Napa Valley. Along the way we listened to Bombeck's The Grass is Always Greener Over the Septic Tank book on tape. I was amused. I was amused yet again today during my son's nap time. (We're currently having the house resided. In order for him to sleep, we have to sit next to the speakers, listen to music and he sleeps on me. This is convenient in some respects and, in others -- not so much!) Today I had to try not to laugh out loud, or shake too much when laughing silently, while reading this book. Here are a few excerpts I found particularly amusing. "You will understand me when as a woman who is married to an amateur camera freak, I respectfully suggest that some kind of legislation be passed requiring a permit to carry a loaded camera. Monthly challenge: 6 down, 4 to go! 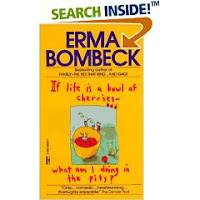 Oh, I love Erma Bombeck! She's beyond hysterical at times. If you have the chance, read her book When You Look Like Your Passport Photo, It's Time to Go Home. It has one of the best descriptions of people who overpack (her husband) that I've ever seen. I read this in high school or college (actually a collection of her works), believe it or not, but I thought she was hysterical!